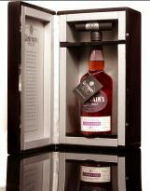 19 May 2009, Edinburgh: Independent bottlers and distillers, Ian Macleod Distillers, is to launch an extremely rare, limited edition Springbank 40 Years Old from its award-winning Chieftain’s Single Malt Whisky collection to the domestic market in the UK and worldwide. Distilled in 1968 at the famous Springbank Distillery, Campbeltown, only 398 bottles of this exceptional natural strength, natural colour and unchill-filtered whisky are available. It is the last, oldest and the best Springbank cask available from the current Chieftain’s collection. The hand-crafted presentation of the Chieftain’s Springbank 40 Years Old is a true reflection of the exceptional quality and rarity of this Single Malt. Sleek and masculine, the bottle rests in a silver leather lined, piano finished, solid oak box which has been stained black and lacquered 11 times, to enhance the natural wood grain. Two silver plaques on the front of the box display all the individual bottle details, as does the certificate of authenticity scroll, personally signed by Antony McCallum-Caron, Chieftain’s Rare Malt Manager. A neck tag, hung on a silver chain, brings the Single Malt to life, with detailed tasting notes on this precious first fill sherry cask. A deep, rich gold colour, with a nose that hints of melon, ginger and light toffee, the palate is spicy, rich cedar wood mixed with herbal undertones and a long, powerful finish. The limited edition release of 398 bottles will be available from July at an RRP of £1,000 domestically. Since 1936, Ian Macleod Distillers, through its dedication to tradition and quality, has amassed an enviable cask stock from Scotland’s many distilleries. These award-winning whiskies range from classic 10 and 20 Year Olds to 50 Year Old vintages. The Chieftain’s collection’s hallmark is that each bottling must be fit for a King, a Leader or in the Celtic world, a Chieftain. Iain Weir, Marketing Director at Ian Macleod Distillers commented: “Chieftain’s Springbank 40 Years Old is a truly rare and exceptional whisky which we are incredibly proud to include in our collection. Established in 1933, Ian Macleod Distillers is one of the largest and most widely respected independent family companies within the spirits industry. The award winning Ian Macleod portfolio, which includes Glengoyne, King Robert II, Langs and Smokehead, as well as gin, rum, and vodka, currently has combined total sales of more than one million cases, with 85% being exported to over 65 markets worldwide. Deep rich gold with amber shadows. Honeysuckle, melon and ginger. Light toffee surrounded by smouldering oak. Fresh maritime notes and harbour rope. Spicy rich cedar wood mixed with herbal undertones. Strong exotic wood fragrance, with delicately sweet grapefruit peel. Long and powerful with coffee, thick dark treacle, plum wine and fresh oak. Exceptional quality from a truly rare, vintage, first fill sherry cask bottling.